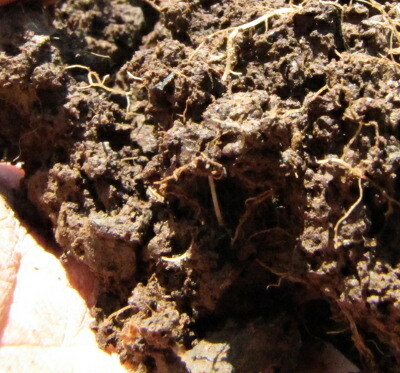 Doesn't the soil in a no-till garden get compacted after a year or two? What happens to the organic matter if you topdress compost every year rather than mixing it in? If you grew up with conventional gardening methods --- tilling up the soil every year --- you might have a hard time wrapping your head around what happens in a no-till garden over time. So I thought you would like to see a bed that's been managed using no-till methods for the last five years. I dug up this bed Tuesday to enable me to plant my potatoes. We started the bed in spring 2007, before I knew what a kill mulch was, so initial soil preparation consisted of having Mark till up the ground and then me shovel the topsoil from the aisles to form raised beds. The bed housed strawberries for a few years, then garlic (which necessitated minimal digging for planting and harvest), then corn. Last fall, I planted the bed in oats --- you can still see some oat roots not quite deteriorated in the hunk of earth above. 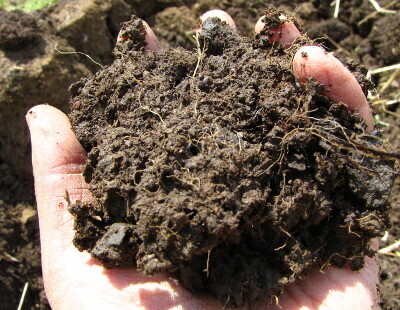 The first thing to notice is that the soil is divided into horizons, just like natural soil in a forest or meadow. (This photo shows a shovelful of earth laying on its side, so envision it turned 90 degrees.) 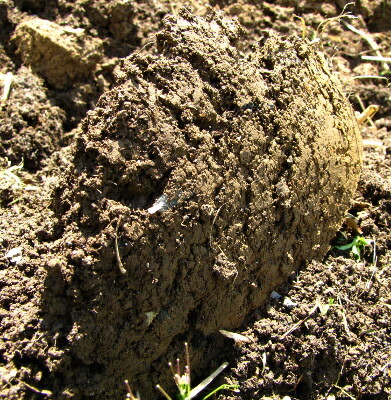 About six inches down, the B layer is mostly clay; above that, the A layer is rich topsoil; and a thin coating of partially decomposed organic matter (the O layer) sits on the top of the ground. Since I don't disrupt their activity with tilling and chemicals, there are plenty of worms in the earth to move organic matter down into the A layer, which is why that topsoil is so dark, rich, and crumbly. No-till garden soil doesn't have the same cake-crumb consistency you'll see in newly tilled earth, but it also is far from compacted. (You can tell your soil is compacted if it's hard to shovel.) When undisturbed, soil microorganisms glue crumbs of earth into larger conglomerates, leaving air pockets in between. When I break apart a hunk of my no-till soil, it feels a lot like a bunch of wood chips attached to each other by mycelium, tearing easily into irregular chunks. Keep in mind that my no-till garden consists of permanent garden beds that receive nearly no traffic (except for an occasional dog footprint, but even Lucy is pretty good about staying off them). The type of no-till farming practices in conventional agriculture circles will likely lead to soil compaction since they run heavy tractors across the earth and kill off the worms with herbicides. In contrast, no-till management in a backyard garden leads to rich, healthy soil that grows great food. Our chicken waterer never spills in coops or tractors. I love the way the soil seems to change after a few years of no-till gardening with a lot of mulch. However, if people do end up having compacted soil --mine tends to go that way easily from heavy rainfall since it is high clay content, and mulch degrades quickly in this hot, humid weather-- then permaculturists commonly recommend heavy rooted species to break up the soil. One specific plant I remember is the daikon radish, but really any desirable plant with a strong root system can do the job. If you leave them in the ground to rot, then you introduce good organic matter, plus you have the air pockets left over after most of the plant has decayed. For this reason, I end up leaving many old annuals alone to decompose in their own time, wherever the space isn't needed for a new set of plants. Sara --- We've got scads of clay and rain, but our soil doesn't seem to compact. I think that if you keep all traffic off the ground, you're far less likely to get compaction. We use oilseed radishes to break up heavy soil. That's the more common name to look for when buying the radishes as cover crops, although you'll also hear them called tillage radishes and groundhog radishes. Daikon radish usually means the edible variety, I believe, which equates to more expensive seed. One tip I learned last year was to cut big annuals like corn and okra off at the base rather than trying to rip the roots out. The root mass mostly decomposes by planting time next year, and even if it doesn't, you can just work around the stump. That's been a boon to my soil structure. The daikon radishes were just the first thing that popped in my mind, but it's good to know that there is a cheaper option for cover crops. I know you've mentioned oilseed radishes in the past, but I haven't read much beyond your posts.